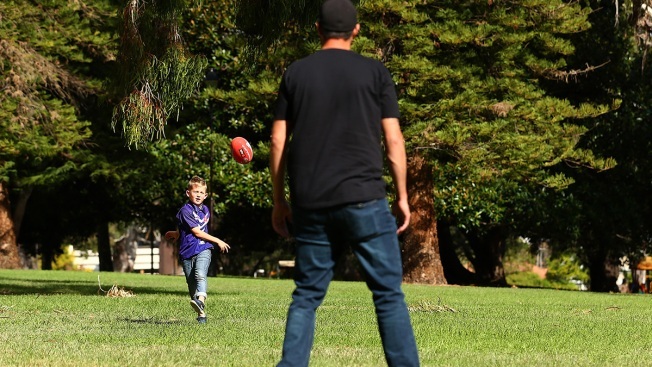 A young boy enjoys a kick in a park with his father before the round one AFL match between the Fremantle Dockers and the Geelong Cats at Domain Stadium on March 26, 2017, in Perth, Australia. "Diapers don’t care who change them." That's the attitude companies are increasingly adopting when advertising products for dads. The diaper phrase, part of Procter & Gamble's #WeSeeEqual campaign from March, captures advertisers' recognition of changes in how society views fatherhood. In the ad, men, women and children defy stereotypes in the roles they take, including a father changing a diaper. Procter & Gamble is not alone: many advertisers are trying to give a truthful representation of fathers in their campaigns. Fewer fathers are the sole breadwinners for their families now, according to the Pew Research Center. In addition, fathers are just as likely as mothers to see parenting as central to their identities. This research can shape how advertisers market their products to consumers. "A lot of [Procter & Gamble's ads] are about breaking down stereotypes and representing this more equal world that we all aspire to," said Christine Wever, leader of the gender equality communications team at Procter & Gamble. Father's Day, which is being celebrated on Sunday, provides an opportunity for advertisers to showcase dads in the roles that they are increasingly taking on in home life, including caretaking and household responsibilities. Dove Men+Care, a branch of the Dove brand and a part of Unilever since 2010, has worked to show fathers in realistic ways when advertising products. Most recently, the 2017 Dove Men+Care Father's Day campaign, #ThereToCare, features men who act as father figures for children in their latest campaign video. "These guys want to see themselves portrayed in media in movies, T.V., pop culture, everything, the way that they're actually acting in their real lives—and that is in the caring role for their families," said Josh Levs, author of "All In: How Our Work-First Culture Fails Dads, Families, and Businesses—And How We Can Fix It Together” and Dove Men+Care partner. Competitors have followed suit in harnessing "modern masculinity and modern fatherhood," according to Levs. Gillette, a Procter & Gamble brand, has garnered praise for its "Go Ask Dad" Father’s Day campaign, which began in 2016. The campaign video features sons seeking guidance from their fathers instead of the internet. "Modern dads are the most misunderstood parts of modern families," said Levs. "We have this scourge of the bumbling, clueless dad in ads, and we have some companies that have stepped forward to take the lead in changing that." Social media plays a role in the shifting trends of advertising to fathers, and families more broadly. But social media platforms' emphasis on picture-perfect moments can distract from the issues that might prevent fathers from spending time with their children, according to Laura Tropp, professor of Communications and Media Arts at Marymount Manhattan College and co-editor of "Deconstructing Dads: Changing Images of Fathers in Popular Culture." "The more we have these positive moments [in advertisements], the less we’re really debating what it takes to allow people to be what they would consider 'good fathers,'" Tropp said. "We’re not discussing paid family leave, we're not discussing people who aren’t given the same chance to be good fathers due to problems within society." In the end, advertisers look to sell products to consumers. But that does not mean that companies do not realize they can effect change. "When you embrace the reality of the modern dad, that we are loving, that we prioritize families, that we are absolutely capable of doing everything that parenting requires, you see fantastic results," said Levs. "People respond, people agree, people believe in it."